The opening of a long-awaited Jersey City bar has been marred by a dress code sign that some have interpreted as racist. 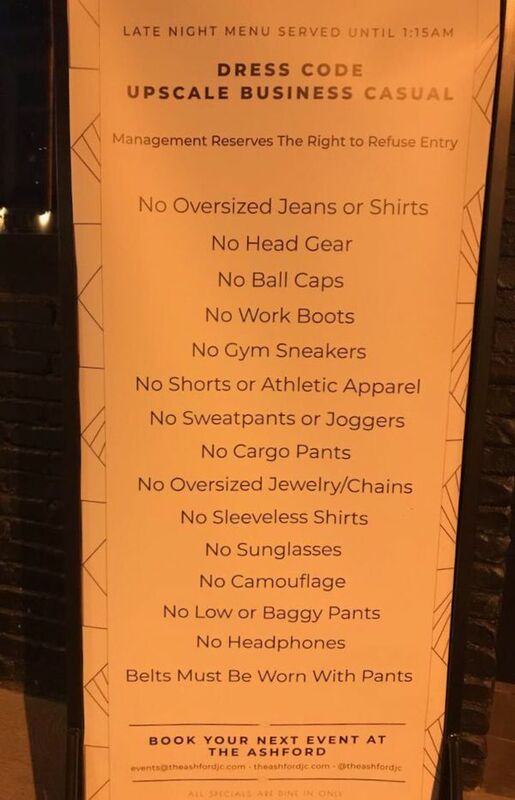 The sign at The Ashford, which referred to its dress code as “upscale business casual,” banned oversized jeans and shirts, head gear, ball caps, work boots, gym sneakers, shorts or athletic apparel, sweatpants or joggers, cargo pants, oversized jewelry and chains, sunglasses, camouflage, low or baggy pants and headphones. The code also required belts be worn with pants. The references to oversized jewelry, low and belt-less pants, and head gear, particularly, were seen by some as racially specific and led a number of patrons to take to social media to question if the bar is expressly attempting to keep patrons of color out of the premises.